The selection of the connector is one of the most important factors that determine the quality of transmission capability of an interconnect cable. 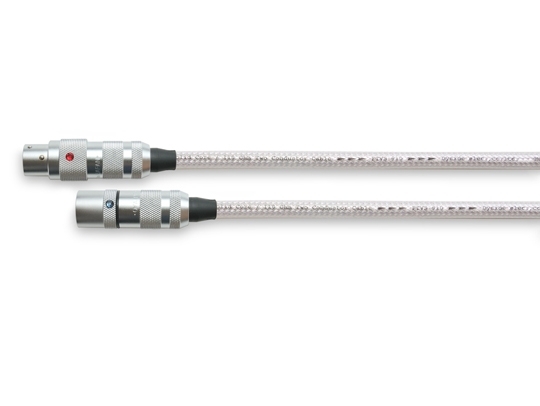 In order to produce the ultimate analog/digital hybrid interconnect cable, we have started to make a selection of the best XLR connector right after we released FTVS-910, the twin-axis pure silver interconnects. As a result of repeated listening tests, the one that proved the highest performance was our original XLR connector, FOCUS 1. As the AR-910, the collaboration between FTVS-910 and FOCUS 1 made astonishing progress in lossless and natural signal transmission. AR-910, made of premium materials, will elevate your listening pleasure to radically new heights. The most distinctive feature of AR-910 is 5N pure silver conductor which is produced by advanced manufacturing processes including the continuous casting process that takes place in a high-frequency electric furnace, 19 stages of cold rolling, a drawing process and a final annealing operation. The insulator is also significant in enhancing the transmitting capabilities of the cable. For the purpose of lessening signal loss, we employed PFA which provides excellent electrical isolation and low electric permittivity. 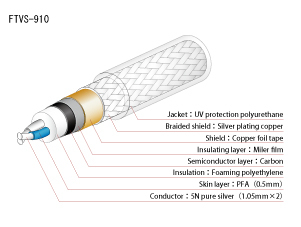 And also we selected PE (Polyethylene) which keeps permittivity to a minimum and enhances the flexibility of the cable. This layering of these different materials not only enhances the conductor's electric capabilities but also attenuates internal vibration by altering the resonance point. The ultra silent background of the AR-910 is provided by a triple-layered shielding structure. The first semiconductor layer attenuates static noise and electric micro waves. The second copper foil shielding protects against high-frequency noise. The third, silver plated mesh shielding, protects against low-frequency noise. Furthermore, FOCUS 1, the original XLR connector, is attached to the terminals of AR-910. By its one-touch push-pull function, cable clamp and ball-bearing locking system, it actualized smooth insertion and tight holding capability. The materials are closely examined for the ultimate quality. The brass body is plated by hard chrome. The contact pins are made of phosphor bronze and plated by silver and rhodium. Each component is processed with remarkable accuracy by CNC machining. Pure silver is the best material for high-speed transmission due to its excellent electrical conductivity which is far superior to high-purity copper. However, the price of silver continues to rise ever higher making it one of the rare metals. For the core of FTVS-910, 5N jewelry grade pure silver, which is far better than industrial grade, is used. After being melted in a ceramic crucible, it is molded into 15mm diameter round bars. It is further reduced in diameter by means of 19 repetitions of the cold rolling process. Afterwards, the silver wire is further reduced to 1.05mm by a low-speed drawing process. After the final rolling operation and mirror surface finishing, stress and strain that is generated by the drawing process is slowly removed by a lengthy annealing operation in a high-frequency electric furnace filled with inactive gas to prevent the silver from combining with oxygen. The completed ultra-pure silver wires are immediately packaged in nitrogen gas and are safely stored until the next process. Although the conductor is the most important factor in signal transmission, the insulator is also significant in enhancing the transmitting capabilities of the cable. For the purpose of lessening signal loss, we employed PFA which provides excellent electrical isolation and low electric permittivity. For the first insulation layer, we selected PE (Polyethylene) which keeps permittivity to a minimum and enhances the flexibility of the cable. This layering of these different materials not only enhances the conductor's electric capabilities but also attenuates internal vibration by altering the resonance point. When we conceived of the FTVS-910 our goal was unlimited transparency. The ultra silent background of the FTVS-910 is provided by a triple-layered shielding structure. The first semiconductor layer attenuates static noise and electric micro waves. The second copper foil shielding protects against high-frequency noise. The third, silver plated mesh shielding, protects against low-frequency noise. It also protects against high-frequency noise by means of the skin effect on the silver plating. Although PFA has a great electric characteristic, we needed to adopt a method for static electricity removal due to the fact that PFA charges easily. When signal flows in a cable, it generates ultra weak vibrations which cause the discharge of an electric corona. In order to solve this problem, we installed Carbon PE as a semiconductor layer. By surrounding just the outside of the first insulation layer, this semiconductor layer helps to discharge static buildup from the PFA layer in an orderly fashion. The beautiful and clear urethane sheathing has excellent mechanical strength and always maintains a stable level of hardness without being affected by temperature change. Moreover, due to its high shock absorption and degree of elasticity, polyurethane provides powerful isolation from vibrations.